Can you feel it? There’s magic in the air. Summer festival season is finally here! Chill on the Hill, Jazz in the Park and River Rhythms have begun their open air residencies. PrideFest Milwaukee was the first of many celebrations at Henry Maier Festival Park. And Locust Street came alive for the 40th time on Sunday, continuing Milwaukee’s strong street festival tradition. 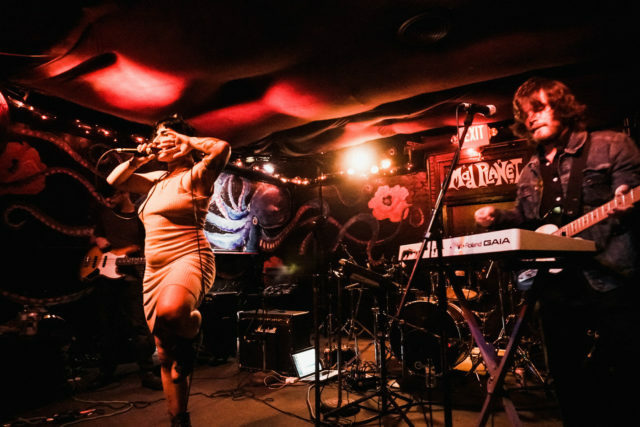 On the eve of summer festival season, two newcomers to the local circuit, Gloss Weekend and Tasty Fest, each packed clubs in Bay View and Riverwest. Both were produced by young local labels, Gloss Records and Tasty Tapes. As it turned out, I already had tickets to two out-of-town festivals and could not attend these maiden voyages. Interestingly, both of the out-of-town festivals were also produced by local independent record labels in their respective towns — Soundset (Rhymesayers Entertainment) in the Twin Cities and Field Trip (Arts & Crafts Productions) in Toronto. Travel is important for anyone, but especially for creatives. New experiences can provide perspective. Getting out of town can help clear your mind. If you stay put, you risk becoming stagnant and repeating yourself. For six months straight my girlfriend and I were grinding in Milwaukee with little rest. I was happy to hit the road for the reasons mentioned above, but I was also sad to miss the inaugural Gloss Weekend. The label is emblematic of my entry into the Milwaukee music scene. Many of my favorite local bands have released projects on Gloss Records. I’ve developed a relationship with Gloss’ label heads Harrison Colby and Joey Peterson. And in just over a year the young label has released 17 limited run cassettes and a few vinyl. Colby, who plays guitar in NO/NO, is currently on tour promoting the new album, so I sent him questions via email. “We started organizing really, really early because we wanted every band on the label to play. We moved the date around a few times where only one artist, Surgeons in Heat, couldn’t perform,” wrote Colby. I went to Riverwest Public House while Peterson was bartending to chat with him about Gloss Weekend. Sam Gehrke, who plays bass in Soul Low, one of the Gloss Weekend headliners, happened to be at Public House when I stopped by. I first went to Turner Hall Ballroom for Atmosphere’s “God Loves Ugly” tour in 2002. I was in high school at the time and the Minneapolis crew completely blew me away. One of the factors that played into my decision to transfer from UW-Madison to the University of Minnesota-Twin Cities was the Minneapolis hip-hop scene in the early 2000s, which was led by Rhymesayers Entertainment. It was amazing to be able to witness Rhymesayers in their prime and be a part of the Twin Cities hip-hop scene as co-host of Radio K’s “The Beat Box Radio Show” from 2005 to 2008. After being a label for a dozen years, Rhymesayers started an outdoor festival in 2008. Due to a series of fortunate and unfortunate events, I wasn’t able to attend the inaugural Soundset, even though I had a complimentary VIP ticket. That initial festival was held in the parking lot of the Metrodome and featured Rhymesayers artists and affiliates exclusively. It later moved to Canterbury Park, a horse racing grounds 30 minutes south of the Cities, and added outside acts such as Kendrick Lamar. Through the years the festival has built upon Rhymesayers loyal following, attracting hip-hop fans from the Midwest and beyond. This year’s installment was held at the Minnesota State Fair Grounds and my girlfriend and I took her kids for Memorial Day weekend. There I ran into old college friends, fellow Milwaukeeans and even comedian/actor Hannibal Buress. It’s hard to compare Soundset to a music festival in Milwaukee, since it’s exclusively hip-hop. 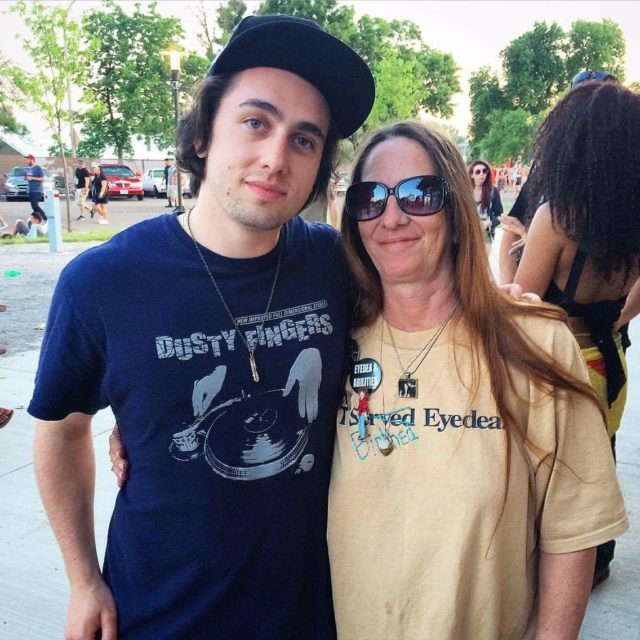 Local DJ/producer/Higher Education Records artist Moses (Mo Pelman) likens Soundset to Irish Fest, in that it’s a festival with multiple facets of a culture on display. 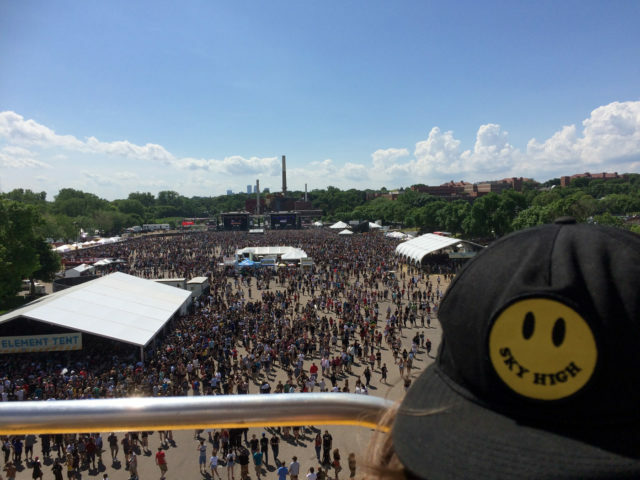 Soundset is unique in that they’ve created a playground for hip-hop heads. 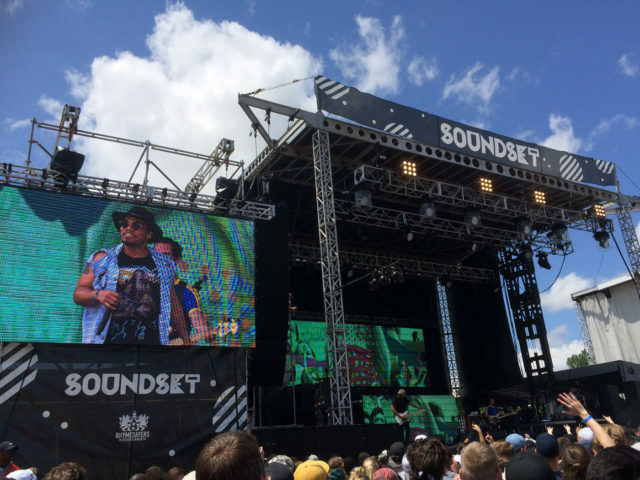 “Soundset embraces the entirety of hip-hop. Each of the four elements is represented in a beautiful collage showcasing breakdancing, graffiti, DJing, and of course, MCing. They have a main stage, break dancing/DJ tent, secondary stage for smaller acts, open mic stage, live spray painting, a skateboard jam, and even a custom bike and car show,” said Pelman. John Kuester, aka Kid Millions, is a veteran of the Milwaukee hip-hop scene. He’s a DJ, a member of The Sounds of Time, and a label head at Dope Folks Records, a local outfit specializing in rare and unreleased hip-hop vinyl. Naturally, he has a relationship with Rhymesayers and has been to Soundset four times. “Soundset is unique in that they’ve created a playground for hip-hop heads. This year’s lineup was by far my favorite, there was something worth checking out all day. If I had to pick a favorite moment it was seeing A-F-R-O!” said Kuester. During Danny Brown’s set I spotted Brendan Kelly, aka BK-One, pushing his kids in a double stroller. Kelly is a Milwaukee native, a founder of “The Beat Box Radio Show,” a producer, and was Brother Ali’s DJ for a decade or so. We caught up next to the ferris wheel while his son slept on his shoulder. “I’ve played tons of festivals like Coachella and Bonnaroo, and they can be a lot of fun, but for better or worse they attract a lot of people who aren’t even remotely interested in what you’re doing. As a fan, it’s really great being immersed in a whole day and several stages worth of programming dedicated to a culture that I love so much,” said Kelly. “Soundset is organized by people who love hip-hop and have been studying it for decades. They invite artists that represent so many different branches of hip-hop and put them together in a way that challenges your notions about what ‘real hip-hop’ means,” added Kelly. The last time I had a celebrity sighting at a music festival was at Summerfest back when Halle Berry was married to Eric Benet. At Soundset I ran into comedian and actor Hannibal Buress, who I interviewed a few years ago while living in Montréal. He’s a huge hip-hop fan and this was his first Soundset. “I like that the main stages are right next to each other, which makes for efficient changeovers. The Roots were amazing as usual. Atmosphere killed it. It’s good to hear that it’s grown every year. I’d love to do something with them in the future,” said Buress. Personally, it was hard to top being on the Ferris wheel with my family while Pharoahe Monch did his classic cut “Simon Says” below. There was also delicious jerk chicken, smoothies, and crowd pleasing sets from Doomtree, Lizzo, and Anderson.Paak and The Free Nationals. My only criticism is that wine and liquor was reserved for VIP ticket holders. However, the “Minnesota nice” ethos allowed my girlfriend, who is gluten-free, to go into the VIP area and buy a cocktail. Rhymesayers’ loyal following is a testament to its presence in the community and the support of and for their peers. The abundance of merch tables with artists tending them at Soundset is representative of that. “We have people with passions ranging from tour booking to show promotion to art to screen printing to cassette duplication, and even website coding. Tasty Tapes is a legal avenue for creativity for our friends too, not just myself and Jeff,” wrote Hoge via email. I first saw The Rashida Joneses at Arte Para Todos 2016 and was impressed. Many of the bands who played Tasty Fest have recently come on my radar, such as Tigernite, Faux Fiction and The Pukes, and I was sad to have missed the festival. “To be blunt, planning it was a total headache, but we had a blast looking back on it. Each day we got a local food sponsor to supply free tasty treats for the attendees, as well as an official beer sponsor, plus additional press sponsors. We also had to manufacture cassettes for Tigernite, Faux Fiction, and the festival compilation. Additionally, since it was a TASTY fest, we wanted the less fortunate to be able to get tasty too, so we asked attendees to bring nonperishable food items for the Hunger Task Force,” wrote Hoge. The response to the food donation request was so generous that some of the boxes were falling apart as they took them out each night. Proceeds from Tasty Tapes merch was also donated to the Hunger Task Force, which helped drive sales. Another highlight was the dozen or so big green inflatable aliens at each venue. “Hilariously, we had SEVERAL people buy advance tickets and show up thinking it was a food festival. So when they came inside and a punk band was banging out a set, the looks on their faces were in-f*cking-credible. That being said, when was the last time you’ve been to a show where people were watching live music with a beer in one hand and soup in the other? Well, that happened one night. 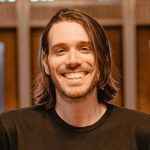 In general, I think that we successfully accomplished our goal of getting a large audience for a bunch of up-and-coming local bands,” wrote Hoge. Similar to Soundset, the Arts & Crafts label in Toronto came up with Field Trip, an outdoor festival in the heart of Canada’s biggest city, to celebrate its 10 year anniversary. 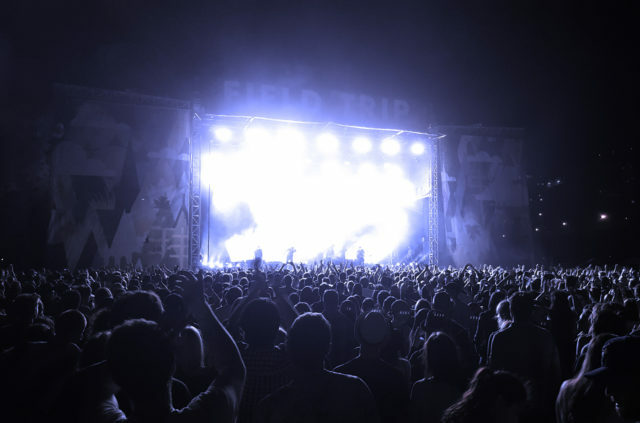 Also like Soundset, the first installment of Field Trip was exclusively artists on its label, but subsequent years have seen performances from outside acts. 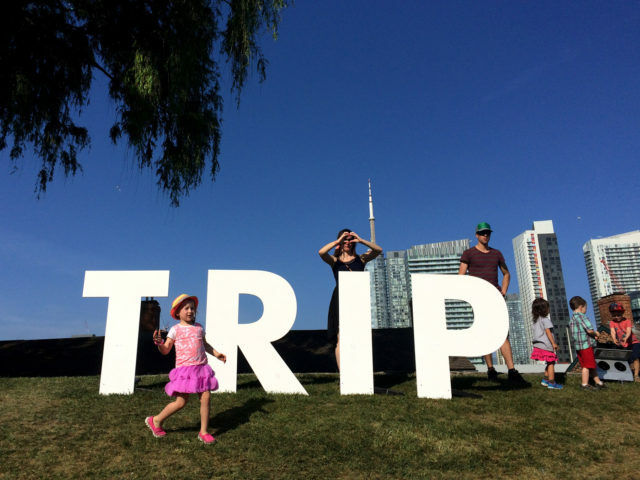 I attended Field Trip 2014, making sure to catch BADBADNOTGOOD (featured in our free download of the week), CHVRCHES (coming to The Riverside in September), and Broken Social Scene, founders of the festival. Field Trip doesn’t cater to a particular genre of music as Soundset does with hip-hop, but there seems to be a target demographic. The festival attracts hip, young parents who enjoy indie music and have a taste for craft food, drinks and goods. It’s the most family-friendly festival I’ve ever attended. Where else can you do yoga during Bully, watch kids hula hoop in front of a vintage bubble machine during Holy F*ck, charge your cell phone by riding a stationary bike during Jazz Cartier, eat ahi tuna and octopus tacos during Santigold, and sip a blood orange pale ale during The National? If I’d been so inclined I could’ve challenged children to a game of ping-pong, decorated my own cupcake, or visited a building from the War of 1812, as Field Trip takes place on a historical site. It has a similar sensibility to Eaux Claires, with curated art around the grounds and a charming, inclusive vibe. Speaking of Justin Vernon’s big camping trip, I can’t wait to head up north for Eaux Claires in mid-August. But before that I’ll be sure to check out a bunch of festivals here at home.